No. 34059 Sir Archibald Sinclair at Sheffield Park. The boiler for No. 34059 Sir Archibald Sinclair with its new inner firebox has returned from the South Devon Railway. After heavy expenditure we now have a boiler fit for purpose. However, the boiler stays and tubes are still to be fitted, along with mechanical work and a repaint before 34059 can return to steam. The 500+ club this year will go towards assisting the financing of this work. All winners will receive their cheques within a month of the draw and a list of prizewinners will appear in Bluebell News and Bulleid Express magazines. Applications for membership of the club will close on 25 February 2019. Members will then be advised of their number(s) for the year. Payment by cheque, cash or postal order is acceptable. A return SAE, minimum size DL 110 x 220mm, 4 1/4” x 8 5/8” or an email address would be appreciated to help us maximise the funds. 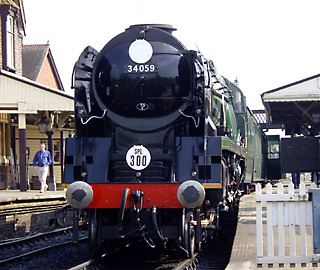 The Bulleid Society and the Battle of Britain Locomotive Group are based on the Bluebell Railway, Sussex.